It would be great to say that it’s unusual when the larger wave, the window of opportunity, the short span of time when the pulse of swell peaks, happens only some mathematically even number of times on a weekend. It just doesn’t seem to be true. One winter the interval between pulses seemed to find it’s high point on Sundays. Sundays, like five in a row before it shifted slightly, but enough for surfers who can move schedules around enough to hit a peak at mid-day on a Tuesday. And it would be not completely honest to say I, usually proud to be self-employed, could take a full Tuesday; more likely I’d take off early and hope, or take off lake and hope that, when I pulled off the highway, bumping down some pot-holed gravel (or not gravel) road, I’d find lined-up, groomed, empty lines. It does happen. Not last weekend. The angle looked good but the swell wasn’t supposed to build, and Saturday morning found Trish and I preparing to take the Port Townsend/Keystone ferry to Whidbey Island, navigate up, past the unseen-but-rumored breaks on the western, straight-line-on-the-Strait-and-to-the-open-Pacific side, then inland to I-5, down a bit, and east to the jaggedy (compared to our Olympics) Cascade Mountains. Okay, enough of that. We were headed to Darrington for a performance by The Fabulous Kingpins. The event was a sort of prop-up-the-locals free concert, the cover tune band from Moscow first hired last year to perform, four months after the horrific landslide in nearby Oso, Washington on March 22nd that obliterated a huge swath of land, more than a square mile, changed the direction of the Stillaguamish River, and killed 43 residents. Imagine your favorite hillside park suddenly obliterated by a huge wave. Driving past, it still looks like some sort of rough-and-rocky preparatory work for a mall parking lot. That would be Moscow, Idaho. I-da-ho. Red state, inland. No surf atoll. Trish and I sent our son James there (his choice, actually) in 1994 to attend the Lionel Hampton School of Music at the University of Idaho. And he did well, for a semester or two. He had auditioned for the Kingpins, but they didn’t want a 17 year old guitar whiz. Now he’s a 38 year old guitar god, Jaymz Dence’, wailing through solos adapted from, but more evolved than the originals on a wide range of classic rock tunes. You can’t help but hear the influence of every guitar player from any-or-everywhere, back porch swamp blues pickin’ to fully-orchestrated concert hall recital, James continues to be a student of the craft. Guitarcraft. 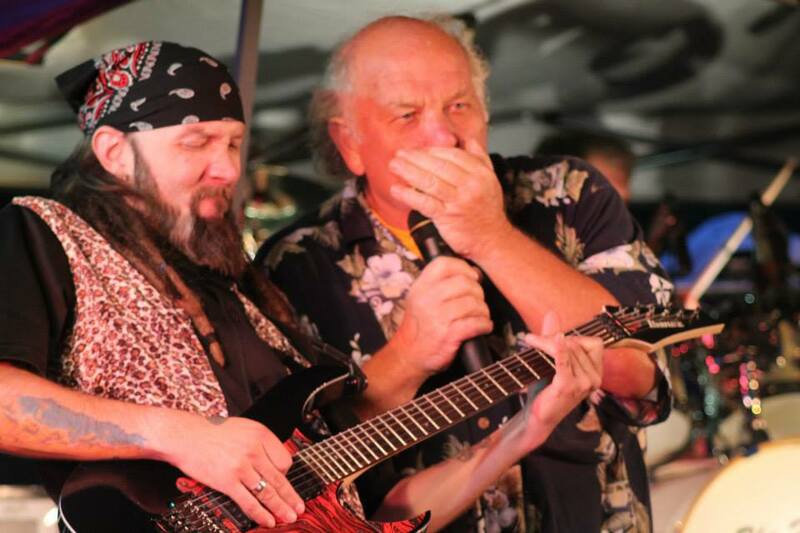 So, how did it come to pass that I got the opportunity to go on stage with my son, play a little harmonica? Because my son had a little faith that, despite my reservations, I could do it (read ‘wouldn’t blow it’). Because Jaymz convinced the bandleader, Cliff, that I (yeah, I’m wearing my lucky, performance-only Hawaiian shirt, but over my Quilcene Shindig T-shirt featuring a drawing of this son, in this, lean-back, pained-expression pose) wouldn’t embarrass him or ruin the Kingpins reputation. So, even though I couldn’t hear what I was playing, and, despite my eyes being opened, really couldn’t focus on anything, it was a thrilling ride; and probably my ‘best ever’ party wave. A video shot by our daughter-in-law, Rachel, shows I was not-quite-awesome, but capable. Sorry, I can’t post it here; but my daughter, Dru, is trying to post the video on the “I’ve heard of Quilcene” Facebook site. As Trish told our son, still packing up the equipment while we were headed west on the last ferry out of Edmonds, “It made his year.” Oh, more than one. Thanks, Jaymz. Meanwhile, Adam Wipeout was sleeping in his car, probably tired from his session at the very peak of the swell, and would awake to more ‘best ever’ waves. More on this later. Drop in on the Mild-Mannered(?) Librarian, and What do you Get? I don’t immediately recognize the surfer in question, but the photo is my new screensaver. Who sent this shot? It’s so clear, so up close and personal. It’s like, um, Exhibit #1, misdemeanor drop in, with felony attempted assault with a deadly SUP. And what about the paddle? I think it’s self defense as the defendant claimed. The photo really needs to go on realsurfers.net. ?That’s classic! Yes, that’s me getting dropped in on by a large, helmet wearing, SUP rider. I totally remember that wave/day well. It was last winter around Christmas when Erwin, Steve and I rode out together – getting a speeding and non-seat-belt wearing ticket in route. I think you came later, Adam. The waves were solid but it got really crowded fast. I had been on that wave since the top of the point when she blatantly dropped in on me without looking about half way down. The shove was purely out of safety. You can post the photo, Erwin. Actually, I have seen the woman in question out on the Strait several times. The first time I desperately wanted to tell her, “Your Mom’s not here; you don’t have to wear the helmet.” The second time was probably on this day. I was pretty busy having lost my board after my leash got ripped loose, first thing in the morning. Swimming with a paddle isn’t all that much fun, with the high tide causing a big beach swirl. My board, which had been caught in the rip, was rescued by Big Dave (thanks, BD). I was not quite my confident self for a while after that, knee-boarding on a few waves I would have (really) stood up on; and then it got crowded. And, of course, there were other surfers clogging the inside, resulting in several other near-misses. And, of course, there was the speeding ticket for me (I went to court and got it reduced) and the no-seatbelt ticket for Keith (he paid it, his wife, Marley, temporarily banned him from riding with me- yes, I should have had the back seat belts out); AND half the surfers on the beach witnessed the pull-over. “Man, when I went by you were spread eagle on the side of the car.” No, I was trying to fish out the belts. It seemed everyone was at that spot that day. Later, Jeff Parrish, who no longer prowls the Strait with me, sent me a video entitled “Kneeboard Magic,” featuring me, three bottom turns, three speed sections, and a clean pullout. You’ll have to take my word for it. AND, the last time I saw the helmet-wearing SUP rider, her surfing had improved, and, since she hadn’t (though others had) dropped in on me, after I got dressed and loaded-up, I walked over to give her a couple of words of encouragement. Really. Alienating Drew Kampion is something that sits high on my worry list; right up there with being called a Kook or a Hodad (first I was thinking young surf punks who don’t appreciate the experience and innate coolness of someone who has been surfing for, forever- but then I really mean anyone, even if I’ve done something Hodad-ish or Kook-like). Mr. Kampion is held in a rare position in the surfing community. While surfers like Miki Dora and Greg Noll are admired for living a lifestyle unavailable to those of us who love adventure yet opt for some sense of security, and other surfers are noted for gloriously blazing and tragically (but, maybe predictably) burning-out, Drew Kampion has kept a toe in the waters and an eye on the changes in the surfing world since the evolution/revolution in the mid-to-late 1960s, pushing “Surfer” into new-age journalism while most of us were cutting old boards down and sticking one hand in the wave to duplicate some controlled sideslip we saw in the magazine. 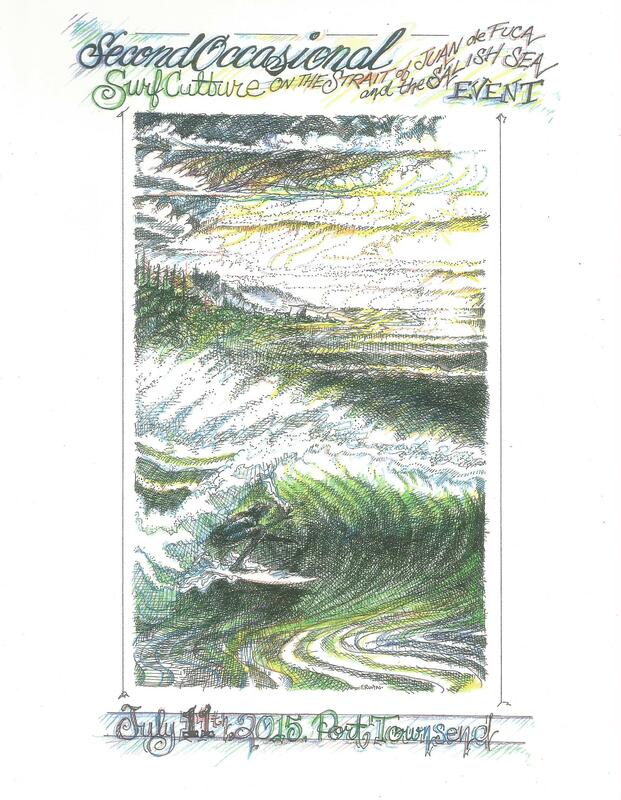 It would be pretty difficult to find a surf-related book without a forward or comment or endorsement by Drew Kampion. Or written by him. Well, there’s cheese and there’s cheese. As I mentioned, I’m fortunate enough to be included in a group receiving a weekly email featuring a poem by Walt Whitman. I always write back something long, frequently something about the latest surf trek to the wilds of the Olympic Peninsula; sometimes a rant. I get back (thrilled to get anything back) some terse and brilliant. I may never reach brilliant… or terse, but I am grateful to not be called out as a poser/kook/hodad; but if I did get called out, I’d have to believe it. It explains a lot. Stephen wanted to buy a book. I wanted a book. I had money, but someone else gave Steve enough for two books. “Steve, I can buy my own book.” “No, I’m buying you one.” Slightly more aggressive, maybe, than Stephen, Justin was busy writing something on mine when Keith came up, saying he wanted a book. He was out of books, but I still had some money, and bought one for Keith, offering some extra money for shipping. In my mind, it all kind of evened-out, and, anyway, I have my personalized copy. So, what I’d like to say is, as always, there are connections, if we attack/interrogate/converse with someone enough to find them. I know this book isn’t the end of Justin’s work; I know attending cheesy gatherings and such activities is important to the promotion process; but, in the same way I hope for the best for those who are daring enough to pursue a career in the dangerous world of art and literature, like surfer/artists Todd Fischer and Jesse Watson, I would like to think Justin’s ride will find success. Go, Justin! A legend on the Strait, TIm Nolan. Google “Tim Nolan and the Wave of the Day” for more. It’s somewhere in the realsurfers.net archives. Still dominates. Oh, and check out the paintings in the background by Stephen Davis (center) and Todd Fischer. part of the crowd at the event. Hey, there were some younger folks, also. No, really. That’s Stephen Davis with the man-bunn. 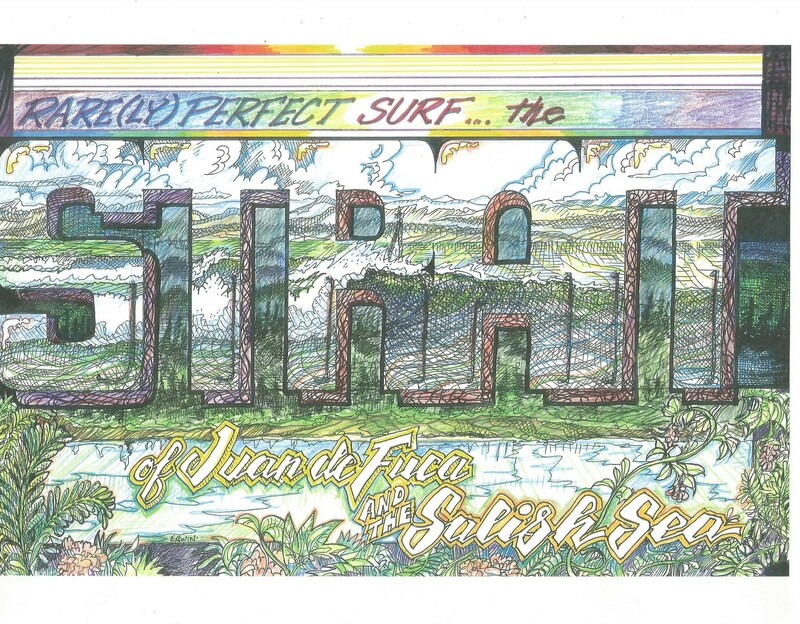 Here’s the piece I read, with minimal ad-libbing, at the recent Surf Culture On the Strait of Juan de Fuca and the Salish Sea Event. I plan on adding some more photos, but it’ll probably be in another post. A pretty successful event- no one drowned, though I did hear some coughing. ONE- I knew the two young guys, one on a soft top, the other on a yellow-but-at-one-time-white board were from Gold Bar, a town somewhere between I-5 and the Cascade Mountains. Because I asked them. Nicely. But I always ask surfers I haven’t seen before. This time, we were at a spot that, legend has it, sometimes features rights, off the island. That’s a clue. I’ve only experienced this lowtide phenomenon once; closeouts across the small bay many times. Archie and I had gotten skunked at the place we had wanted to surf. At this spot there was a sandbar, there was a makeable right. There were several other surfers out, including a guy on the longest longboard ever, paddling with way too much nose out of the water (sure sign of a beginner/kook), but waiting in the perfect spot, catching the best waves (as in, the ones I wanted), jumping up, clumsily riding, arms flailing, and, somehow, making waves. “Hey,” I said, nicely, “you don’t need that much nose out of the water.” “Hey,” he said, kind of snottily, looking at me kneepaddling a stand up paddleboard; “aren’t you supposed to be standing up on that thing?” “Oh,” I said, “yeah, I think so.” Eventually, whether or not he appreciated it, the surfer from… I didn’t ask where he came from… he got a rare treat; really great waves. Archie and I enjoyed them for another forty-five minutes after Long Longboard Guy left. Then the waves left. 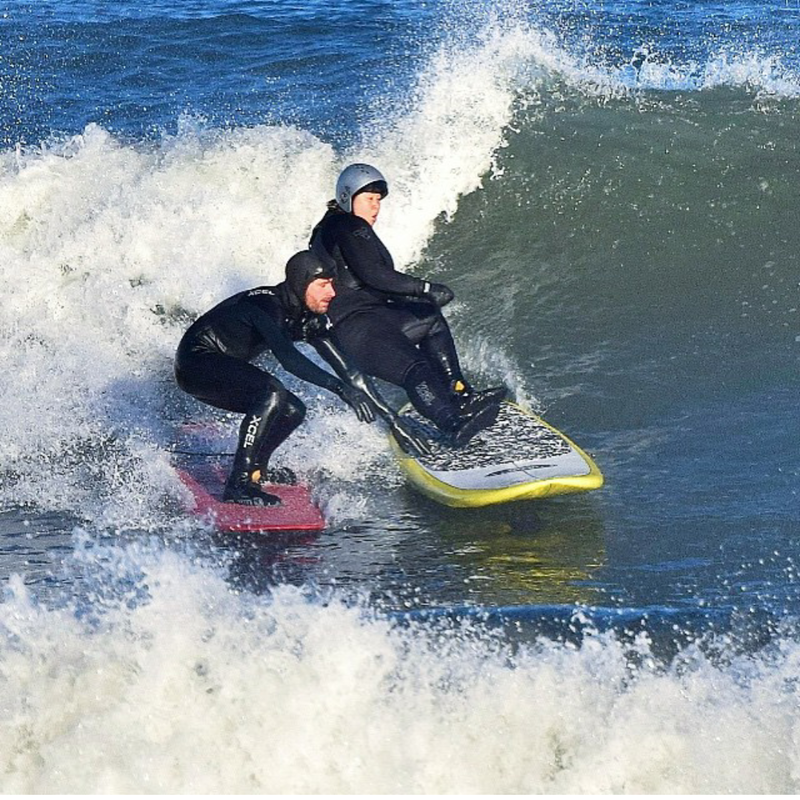 So, several waves later; and this was a few years ago, and I was on a non-SUP… just so you know… I took off and did what old fat guys who have ripped or torn, or merely worn out, tendons and ligaments on each knee, do on very small-but-peeling waves; I rode them on my knees. That made the wave, like, chest high. One of the Goldies was on the shoulder, doing the head down paddle-like-you-mean-it, and… and I know every gremmie practices this, the jump up to spiderman move, on the carpet of his mom’s house, out in the schoolyard to impress inland girls, wherever, and, whether they’ve actually caught the wave or not, the beginner is likely to leap up. Up until a certain point in my board surfing… career, life, experience… I truly believed, and frequently stated, that I could remember every wave I’d ever ridden. And, further, I believed that there was something magical about catching, riding, or even watching a wave from the first line on the horizon, to the last wash up the beach. I still believe in the magic, and, though I have trouble remembering individual rides, even from my most recent session, my mental harddrive is crammed with images from 50 years of board surfing, with mat surfing, surfie surfing, body surfing before that, and, possibly, I like to believe, even some foggy recollection from my first three years of life, on the beach in Surf City, North Carolina, toddling down a bit of an incline, somewhat ahead of my mother, toward the waves. Waves. The early morning light on the east coast is like evening on the west; the view from the water reverses the colors, dawn to dusk. 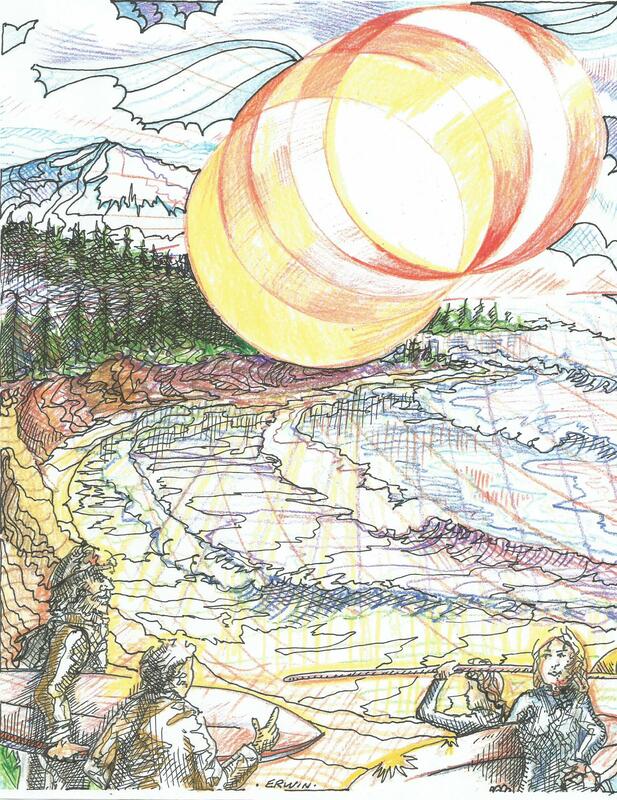 In winter, on the Strait of Juan de Fuca, the sun hugging the mountains, it’s dawn all day. And then it’s dark. The images are all so clear; things I’ve seen- storm surf with sideways-ripped waves, lines of broken soup to the horizon, indicator sets in the kelp beds with the greenest color on the wall as each wave lifts, toward the peak angle on a surfer hard against the wall, a whale in the darker corner of a cove blowing a geyser, the view of waves between the houses and along the low sections of old Highway 101, Oceanside to La Jolla, nineteen fifty-something. And more. I can conjure up the photo of Rincon from the hill, from a mid-sixties “Surfer” magazine, a guy on the hill at dawn, witnessing lines to the horizon, and… and maybe you know the photo. So, my beginning hypothesis was: If we store a mental slideshow, and add to it over time, then, if a surfer wants to do some mind surfing, at any given time, those images can be brought forth, and that would be magic. And I want surfing to be magic. The problem is, all our memories are fiction. There’s some Master Record of All Truth, and then there’s our version. “Overhead and glassy at an afternoon session at Cardiff Reef in 1967, the time Phillip Harper had to get rescued?” Maybe. And that photo. I looked for it online. 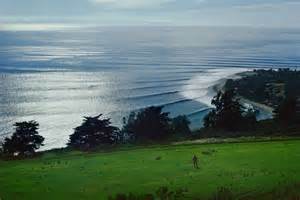 No, it was afternoon, the same lines at Rincon to the horizon, and published in “Surfer” in 1973. 1973? What? Can’t be. I wasn’t studying surfing magazines in 1973; maybe a glance at the grocery store. If I’m wrong about that, what about the image of the competitor freesurfing before the Oceanside Invitational in 1965? My slideshow has the guy taking off, dropping with the wave, an attempt at a headdip turning into a vicious lip-to-the-head, pile-driving wipeout. Wrong. I was the kook, paddling out because I was too embarrassed by my sister, Suellen, running around the beach, collecting autographs from surfers like Mike Doyle, even chatting with Doyle’s mother, that kind of thing. The real truth might be that the surfer possibly could have made the wave if some gremmie hadn’t been directly in his way. Still, I like my fiction better. It was still an hour and a half before dawn when three Peter Pans met at Fat Smitty’s, quickly moving boards onto and gear into the vehicle owned by the oldest of the three Pans. Heading west/northwest, coffee and expectations bouncing around inside, there would be adventure and excitement on this, as with most expeditions. Stories would be created: The drunk/or/sleepy driver; traffic tickets; a ripped-loose leash and a lost board saved by Big Dave; waves cresting near the pilings; the guy with the Shamrock on his board shoving Brett’s board back as he attempted to even a score for undue set wave hogging, and the follow-up screaming match in the lineup. But, each of the Peters ended up with his fictional(-ized, maybe just slightly) account to save; each of us caught enough waves, got enough good rides. Other things, like real life, could be discussed on the way back home. A few days after the above session, Jeff, a guy I occasionally sought waves with before his wife, my daughter’s old school friend, Ruth, got into surfing and they became what I call a ‘surfing power couple’, and who I didn’t realize was on the beach on that day, sent me a video of me ripping three bottom turns and totally in position on three sections before making a smooth kickout. So, I was right. I do rip. So, here’s the go pro my daughter bought me. Thanks, Dru. GoPro selfies always, and it doesn’t matter if the surfer is on a small wave or huge, just look like someone doing calisthetics. But, a shot down the line… better. If you could access your mental slideshow, bring up a just-glassed-off afternoon session. Now, a wave approaches. You paddle over to get near the peak. You wait, wait, then turn, throw your weight down, then use that rebound to start your paddle. One stroke, two; you’re dropping. You lean a bit more toward the peak, allowing the board’s dropping ease your leap to your feet, with, in the same motion, a smooth turn off the bottom. You spot a place high on the shoulder and down the line… When you hit it, you’re so close to the top, ribs of feathering wave in front of you. There’s a real question as to whether you can make the wave. You shift your weight forward, allowing the back inside edge of your board to release. All right, so you made the wave. Great. Or you wiped out. That happens. No big deal, unless you had put yourself in that one moment; then it’s memorable. Click. 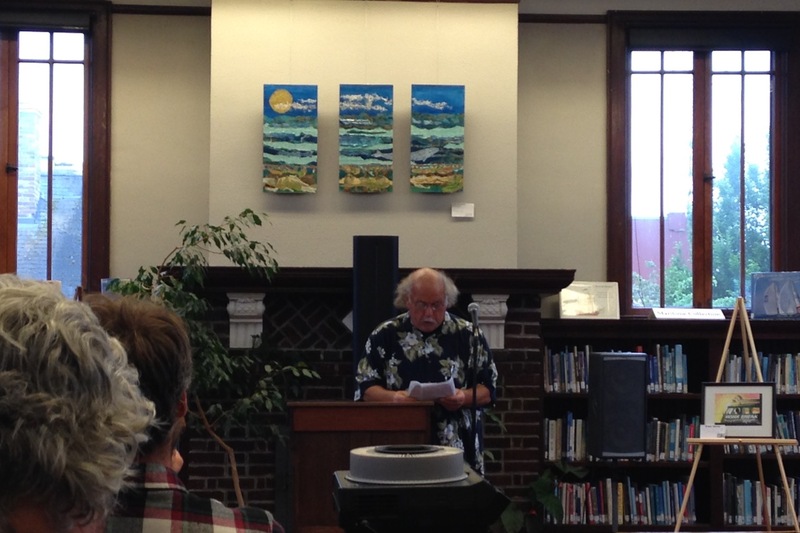 Somewhere before it was my turn to present my short story, “Locals,” I realized a twenty minute reading wouldn’t work with the somewhat fractured audience. By fractured, I really mean distracted. 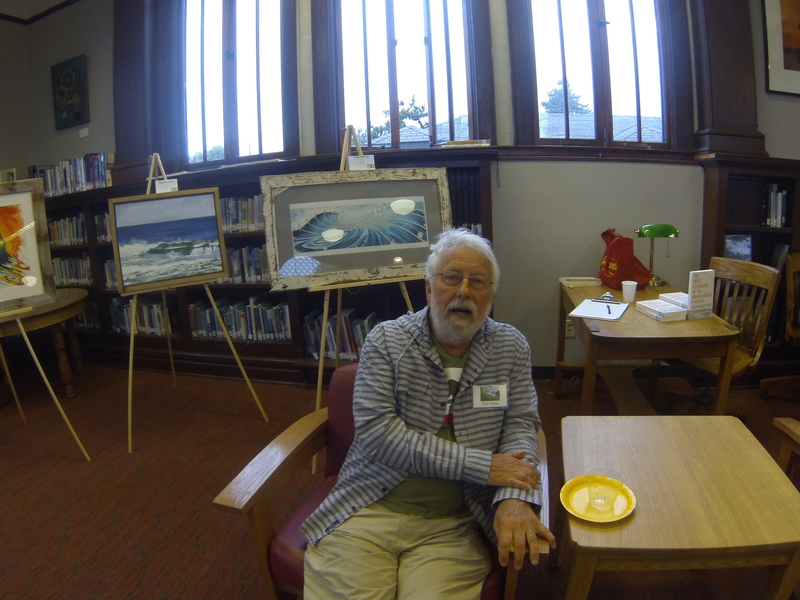 There was a lot going on in and around the Cotton Building, the former Port Townsend Police Station, and, for this evening, the site of the first ever Surf Culture on the Strait of Juan de Fuca Cultural Event. The Kinetic Kar thingie was happening nearby, there was a dance about to happen at the American Legion Hall, and, hey, it was a High Season Saturday night on Water Street. Former “Surfer” magazine (and many others) editor and the man whose name must appear somewhere on any jacket for any authentic surf-related book, Drew Kampion, was just finishing a slide show. He’d been there (everywhere, with photos to prove it) during surfing’s post-Gidget, short board evolution. 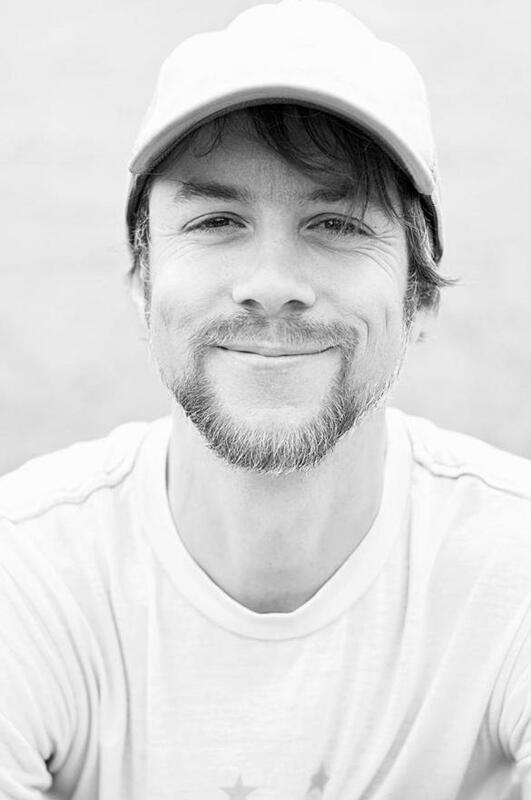 As a writer/journalist, Kampion was the Hunter S. Thompson, the Tom Wolfe for surfers. Yes, Wolfe wrote about surfing, but he wasn’t a surfer. Somewhere after Drew’s casually-presented show-and-tell, with insider stories; with Archie Endo (he volunteered for this, and was very well received) playing surf tunes through a little amp; with people milling about near the tables and easels of art work by legitimate, professional artists Todd Fischer and Jesse Watson, checking out a painting by Stephen Davis that just (I mean just) sold to a surf shop in Malibu; with photographs by Christian Coxen; with some people taking to seats who clearly thought this was some other event; with people (some possibly bored tourists) wandering in off the street; I knew it would soon be my turn. This first event came together much like the actual local surf scene; word of mouth, which includes texting, e-mails, random meetings between surfers at Waste Not Want Not (used merely as an example). Keith Darrock, surfing Librarian, came up with the idea of doing a surf-centered event, possibly including me because we ran into each other while looking for surf at a sort-of secret occasional-breaking surf spot. But this is how it worked. Tim Nolan, boat designer, will be displaying his new paddleboard and the cad drawings for it at the upcoming event, partially because Keith ran into him at a surf spot past Joyce. 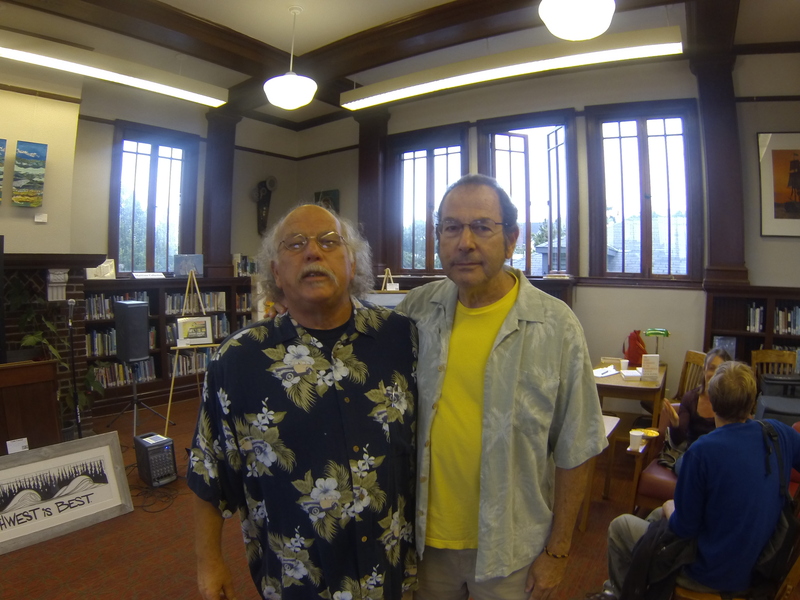 I recommended Mr. Kampion, who actually dedicated a poem to me in “Surfer” magazine in 1969 (possibly because I have a funny name and did have a poem, heavily edited, published in the magazine in late 1968, written when I was 17), and who now lives on Whidbey Island. Keith reached out to him, he agreed to come over, and, relief, now I was the opening act. Except I wasn’t. I was scheduled last. I tried to appear calm, but actually was unable to see the audience through my reading (only) glasses. That was just as well. I had rehearsed, thrown in some choreography, timed my readings. I didn’t want to screw this up. At a normal, conversational rate, it took about nineteen minutes to read through. So, this time, for this event, with the Northwind Gallery involved, there may be a bit of a change in the demographic. I would say more sophisticated. Maybe. 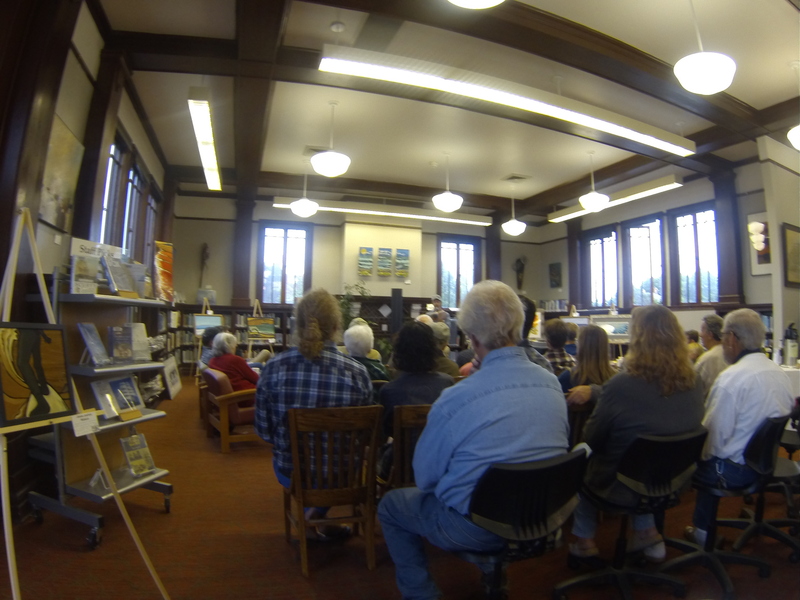 Maybe the Port Townsend literati. We’ll see. Most of the original artists will have works on display. Background music will be provided by Pete Raab, including a couple by Archie currently working and surfing in Thailand). Drew Kampion has agreed to come back. Author Justin Hocking will be the main act, and I’m not sure how Keith arranged this, but, wherever I am in the lineup, I’ll be reading something shorter. And slower. But I can read it faster if I have to. 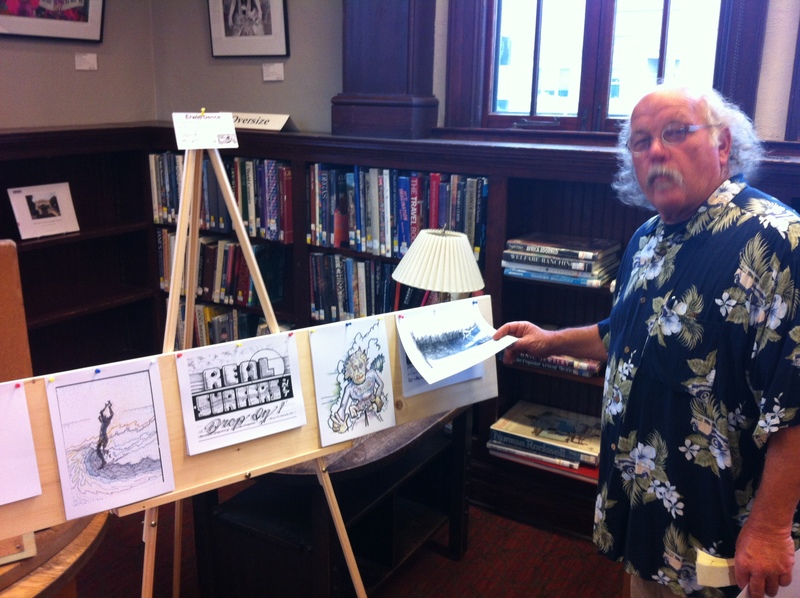 See you this Saturday, starting around 6pm, uptown Port Townsend, upstairs at the Carnegie Library. My sister, Melissa Lynch, texted me the other morning to tell me how annoying it is to her that I seem to apologize for my illustrations. 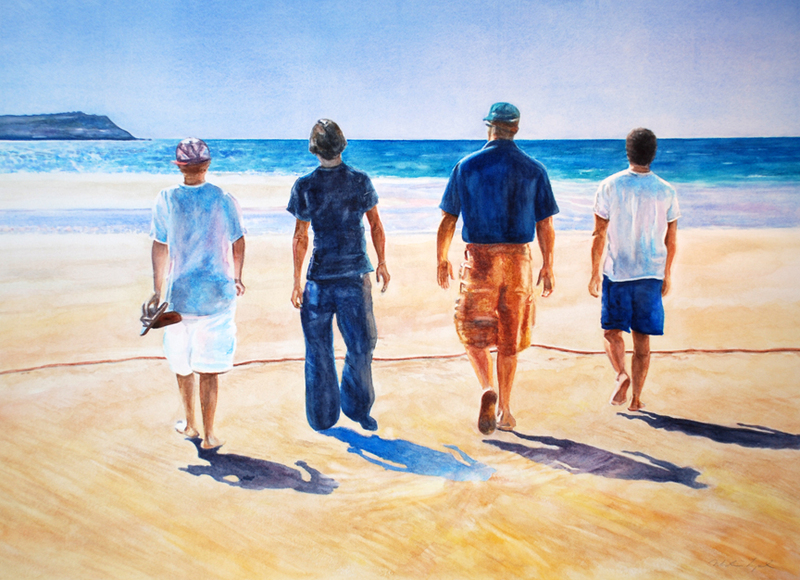 I texted back, asking why this watercolor, which I thought was actually titled,”Boys on the Beach,” wasn’t on my site. Texts can be so easily misinterpreted, so, after a couple of confused back-and-forths, I called her. The upshot is this: I’m a fricking genius and my stuff is incredible. However, it should be quite obvious why I’m intimidated by my sister’s work. The watercolor is a commissioned work, done for a woman who lost one of her four sons. Though Melissa criticized what I thought was merely me candidly explaining my process, she did say, in reference to the piece, that she wanted to add a hint of the (stuck for a word here, don’t want to say ‘mystical’ or ‘divine,’ as they are words too easily pushed in one direction or another)… mysterious. And she, of course, succeeded. We discussed how fear plays into art, how we each strive to replicate what we see in our minds. “Blah, blah, blah” you can quite rightly say, “it’s like poets pathetically pontificating.” No, don’t say that. Did I say ‘intimidated?’ I meant ‘inspired.’ It’s just that my medium, and my muse, and my, um, choice of subject matter… what I go for is, what I’m striving to attain is… I’ll stop. Okay, geniusness. It’s just that… it’s just that I know better. Not apologizing, however. Thanks again, Melissa.